November 6, 2012, is perhaps the most imperative election day in over 140 years of US history. And, from what I’m seeing, everything will be all right now. Why? Because the Democrats are going to find out the US is not gonna throw its heart away. It has Serius XM Satellite Radio. A whole lot of channels of music. I turned my TV on to the Serius XM Satellite Radio “70s on 7” channel. Oh my, the memories! And the great music! I could listen to all the great music from 1990 till now on my half hour lunch break, and still have time for quiet, peaceful reflection. Not so with the music coming out of the 1970s. I could spend my entire 12 hour shift listening to only the best of the 1970s and still miss out on massive amounts of great 70s music. What qualifies as music in the post-modern world of today cannot hold a candle to even the mediocre music that came out of the 1970s. Despite not being a “collector” type myself, a number of years ago I decided to make a collection of something that I thought would be both useful, and potentially one day, have some modest economic value or interest . Some people collect stamps. Others, collect coins. Well-heeled or highly motivated types often collect motorcycles or automobiles. My notion, was not to make a “gun collection” in the usual sense of the word, but merely to obtain a representative selection of off the shelf, lever action rifles, of a bore suitable for big game on the order of deer and bear and possibly elk. At the time there seemed to be an unusually broad selection of available models, some of which, the Winchester Model 1895 for example, had been reintroduced, after years of suspended production. Other models, like the Savage Model 99 were rumored as destined for discontinuation. Minimal investment, maximal utility (for a hunter) and substantial technological interest from an historical point of view, made it all seem like a good idea. The problem with these kinds of items is that their value as a collectible depends in part on the fact that they are not treated as such from the start. If every comic book every kid bought was saved in a wrapper, if no ungrateful boy deliberately drove his train set off the ping pong table just to watch it crash over a “cliff”, then these things would be anything but rare. And while landfills would be considerably less full our dwellings would be considerably more so. Grown-ups are aware of this process of natural and necessary attrition, and this realization may be part of what is behind parents or grandparents starting kids off with stamps, or pennies, or as my mother did with my much younger kid sisters, a series of expensive but probably now worthless American Something or Other dolls bestowed upon them every Christmas for years. That latter example kind of defeats the purpose of the whole exercise though. What’s the point of buying an expensive “collectible” when every example issued is stored away on a closet shelf for two decades in the wan hope that it will represent a small fortune someday? Anyone want a set of Franklin Mint commemorative “coins”? So if the average man is going to collect he might as well do so for pleasure. And adult people experience harmless fun in collecting all kinds of things – even obsolete business machines or manual typewriters, for example. There are of course the better known farm tractor collectors, and lawn mower collectors, and 1930’s dinnerware collectors. I don’t know if there are collectors of those 8mm formatted films of 1930’s cartoons which were used to demonstrate home movie projectors to potential buyers in the 1950’s and 1960’s, but I would not be surprised if there were. Now guitars are of course, are something that we would expect people to collect. The best of them are beautiful, functional, and in many cases economically valuable from the time of their creation; only to grow more so with time. Check out the going price of a 1954 Les Paul Gold Top, or a 1962 Fender Stratocaster in pristine condition if you need convincing. But what about those “other” guitars? What about those economical, second-tier, private labeled, entry level player kinds which were advertised in the department store catalogs right up through the 1980s? 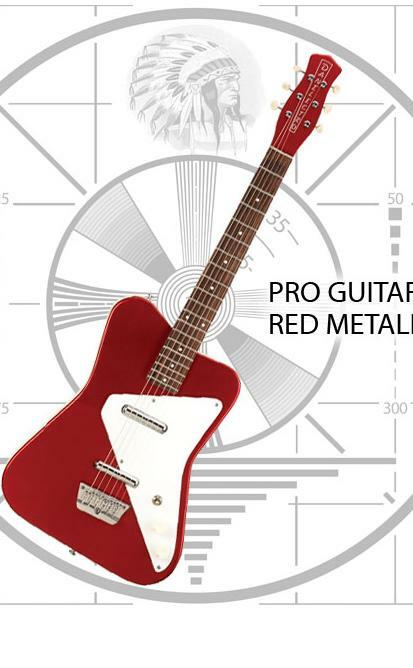 Would anyone really want, say, a 1965 Danelectro? Or how about a Sears Silvertone hollow body made by some company like Harmony or Kay? [These are sold but you can still look] It turns out they do and the answer is yes. People do collect these items with some obvious enthusiasm and even whimsical reverence. And if you think about it, there are many worse hobbies, than that. Here’s a fellow that put his interest in guitars to a good use. I don’t think he is playing an Harmony or a Kay, but I think he is doing rather well all the same even though I don’t care for this tune by and large. The old guy on the fiddle is someone famous from years ago. An Italian aristocrat who took up with some Belgian Gypsy guitar player and with whom he had some success before WWII. I don’t know. There’s probably something worth investigating there too. Not all that bad for an all-girls country band from England, right? Music quit being produced, for the most part, after the 1980s. That goes without saying. So, when I think about various songs, then and before is where my mind travels. And I remembered a very beautiful love song, so I looked it up on YouTube. Isn’t it interesting that something you remember as something absolutely beautiful actually has some rotten stench to it after you take the time to actually review it? Absolutely beautiful song — until you get to the rot-filled two-line twist, which completely changes the meaning of the entire song. Despite that, it’s a song that comes up in my mind from time to time. Not the words I was looking for. You picked a fine time to leave me, loose whee. But this song will do in a pinch (if that’s what they’re calling it these days). As 2011 comes to a close and 2012 comes roaring in, expectations for the new year are high, especially in the political arena. As the events of 2009 brought about a major awakening in America, causing the historic 2010 elections (over 700 previously Democrat-held seats flipped Republican), just so the events of 2011 portend to a continued return to Constitutional sanity in 2012 as the disaster that has been our experimentation with Socialism continues to be erased. From all of us at Truth Before Dishonor to all of you who read us, may your New Year be more blessed than the old one and may your family be blessed.